On August 20, Greece will end nearly a decade of international assistance. Greek and European Union officials have characterised Greece as in recovery, with unemployment numbers down and the economy growing. But a taxi driver I spoke to in Athens said the recovery isn’t reaching most regular Greeks, who are stuck on part-time salaries paying exorbitant electricity costs. Meanwhile, he said, young people are still leaving in droves as they see little hope for the future. I make a habit of talking to taxi drivers when travelling. And not just for recommendations; I ask them about their country. Most have something insightful to say. In South Africa in 2011, I learned about the roots of persistent public transportation strikes in Cape Town. In China this past spring, half of the taxi drivers wanted to talk to me about why the US was in a particularly bad position to pressure China in a trade war; the other half wanted my earnest opinion over how their country was developing compared to the US. In Bali in May, every taxi driver talked to me about their persistent battle with ride-sharing companies like Uber and Grab and how technology was upsetting centuries-old traditions in Indonesia. I didn’t know what to expect on a recent trip to Athens. Coming from the irreality of Mykonos, an island haunt favoured by the rich and powerful, Athens feels light-years – not a couple hundred kilometers – away. I hailed a cab from Lycabettus Hill, a popular place to watch the sunset in Athens, and was picked up by Ilias, an Athens native with long steel wool hair pulled into an unwieldy ponytail. He didn’t want to use his last name so he could speak freely. I asked him what I always ask: Has the city changed in recent years? It’s an innocuous question that usually gets a revealing response. ShutterstockUnemployment in Greece has dropped from a record high of 28%, but many Greeks are still feeling the squeeze of recovery. In the case of Athens, I had expected something optimistic. The country has suffered an unparalleled economic disaster for most of the last decade. But the most recent reports have painted a brightening picture. After eight years and $US375 billion in international assistance, Greece is set to exit its third financial bailout on August 20, the last country to leave financial bailouts that the European Commission, the European Central Bank, and the International Monetary Fund extended since 2010. Unemployment has dropped from a record high of 28%. Prime Minister Alexis Tsipras and European officials have talked up the country’s recovery. Try telling that to Ilias. The so-called recovery hasn’t reached most regular people, he said, and all Greeks have to show for austerity and the bailout is the loss of their country. “The bailout has been very good for Europe. Nothing in Greece is owned by the Greeks anymore,” he said, calling out industry after industry that has been been privatised and sold off to corporations from other countries. Last year, the country sold control of 14 airports to the German airport operator Fraport for $US1.39 billion. In May, Germany’s Deutsche Telekom increased its ownership stake in Greece’s biggest telecoms operator OTE from 40% to 45% for $US329 million. Italy’s state-owned Ferrovie dello Stato Italiane bought the Greek railway TrainOSE last year. Chinese company COSCO bought a majority stake in Piraeus – one of Europe’s biggest ports and considered by many to be the country’s most important asset to be privatised – for $US312 million in 2016. For years, Greeks have been fighting efforts to privatize their water supply. “Multinationals will run this country in 20 years,” Ilias said. European officials and the Greek government have said repeatedly over the years that such privatization efforts are critical to successfully getting the country out from under its overwhelming debt. But, to Ilias, such efforts have shown him that the government is not for the Greeks, but for the country’s international creditors. He pointed to the country’s escalating electricity costs, saying that the average electricity bill for his family is $US462 a month. If he wants to run air conditioning for a few hours a day, it could go up to $US752. “No one can afford it,” he said. The European Commission’s Directorate General for Energy said in a report from May that Greece has the second-most expensive wholesale electricity in Europe. But that hardly tells the whole story. As the standard of living has gone down in Greece, electricity has skyrocketed by 157% over the last decade. One report found that Greeks pay the most for electricity in Europe, with 42% of the bill being taxes and fees. Thousands have said their bills are unpayable. The situation is so dire, Ilias said, he sees little hope of recovery in the future. While reports say the average Greek salary is over 1,000 Euros a month, a large percentage of Greeks are stuck with part-time work and a salary closer to 400 Euros a month. “In order to live with dignity, you need to make 800 Euros a month. But so many only make 400 Euros,” Ilias said. Nearly 500,000 Greeks have left the country during the course of the crisis and, with little opportunity, more continue to leave. They don’t see a future for themselves in Greece, which makes it impossible to develop the country or recover the economy. 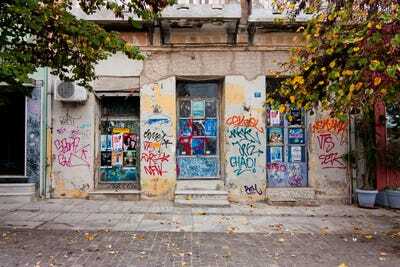 “Young Greeks have given up on the country. They’re leaving. Greece is finished. There’s nothing to save,” Ilias said. As with everything I hear from taxi drivers, I take it with a grain of salt. What they reveal is not always exactly truth, in the capital-T sense we pursue in journalism. But it is a kind of truth that can help reveal where a country is at. Despite the rosy picture European and Greek officials are painting, the mood among at least some of the public is not nearly so optimistic.